A wholesome and nutritious meal – Moong dal khichdi made from rice and moong dal (split lentils) is comfort food at its best. This one-pot, 5-ingredient meal is easy on your stomach and is perfect for all ages. Strangely, khichdi is the piece de resistance even when you have a buffet style meal; I remember we’d go to this restaurant called Rajdhani in Bombay serving great vegetarian fare and even after all the multiple veggies and rotis, I’d wait for the khichdi served with a dash of ghee. What is khichdi made of? 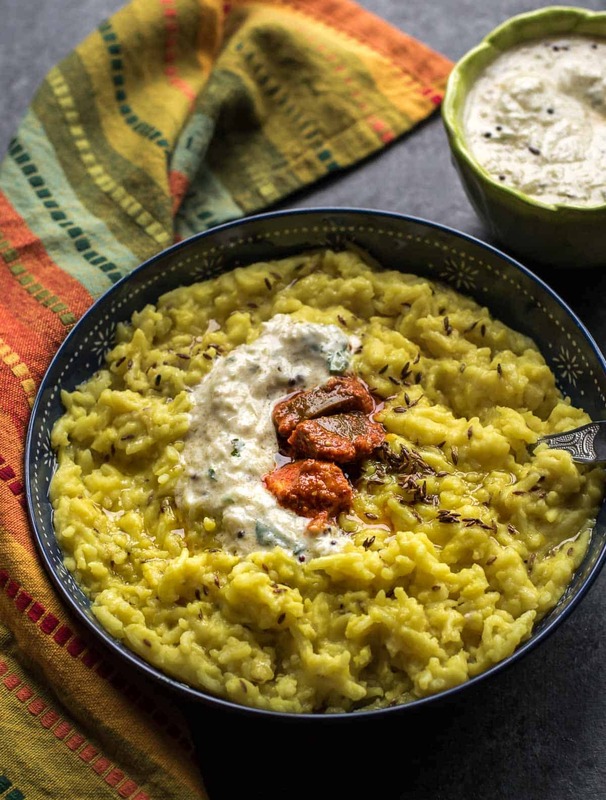 Is Khichdi good for you? 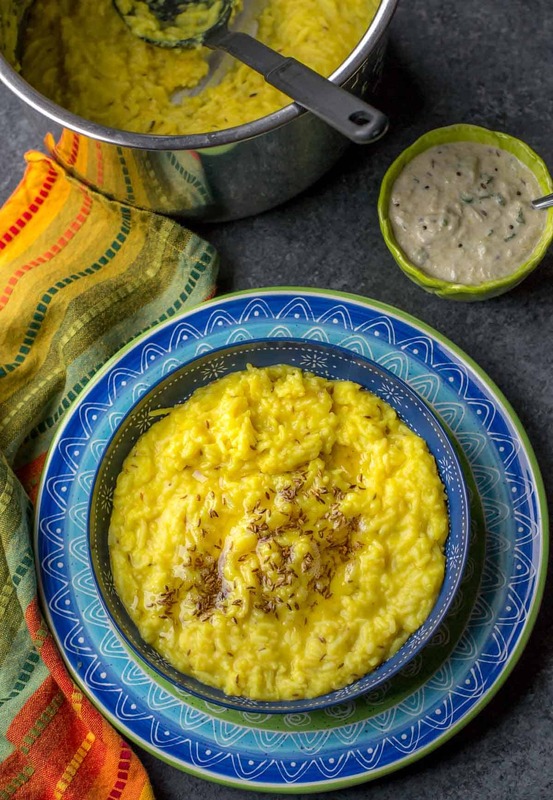 Moong dal khichdi is made from rice, split lentils such as moong dal, turmeric powder, and salt and topped off with a tempering of ghee and cumin seeds. Rice and lentils serve as a good source of carbs and protein while ghee provides the much-needed macronutrients – carbs, protein, and fats. Load it up with veggies to make it a full meal. Amongst all dals, moong dal is the easiest to digest and that’s the reason when we start solid food for kids, moong dal khichdi makes for a great choice. It is also perfect for when you have an upset stomach and prefer to eat something light. 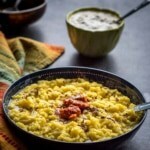 How to make moong dal khichdi? 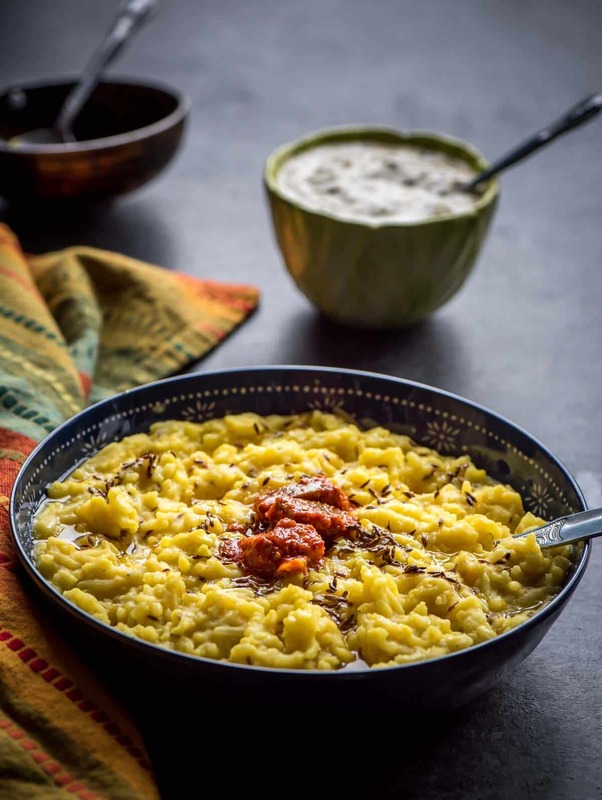 The simplest and the most basic moong dal khichdi is made by cooking rice, split moong dal along with salt and turmeric powder and tempered with ghee and cumin seeds. To make masala khichdi, you would add onions and tomatoes to the mix along with coriander and cumin powder. Some even temper it with spices such as bay leaf, pepper, etc. To make a vegetable khichdi, include veggies such as peas, potatoes, beans, cauliflower etc. It is clearly a great way to work more veggies into your meals. Heat ghee in a pressure cooker over medium heat. Once the ghee is hot, add cumin seeds and when they start to splutter, add the rinsed rice, moong dal along with salt, turmeric powder, and asafoetida. Add about 4 cups of water and mix well. Close the lid of the pressure cooker and place the vent on it. Cook the khichdi in the pressure cooker till the vent or whistle goes off 4 times. Set it aside to cool. Serve hot with a side of curd and pickle. Add oil in the steel insert of the Instant Pot and press the Saute function. Press the Adjust button to move the selection to "low" and wait till the display reads "Hot.” Add cumin seeds and when they start to splutter, add the rinsed rice, moong dal along with salt, turmeric powder, and asafoetida. Add about 4 cups of water and mix well. Press "Warm / Cancel" button and then select "Pressure Cook." Adjust the time to 20 minutes and pressure selection to high or alternatively select the "Porridge" setting. Cover the Instant Pot lid and lock it. Make sure the vent is at sealing position. Wait until the vent returns to the venting position before checking on the khichdi.